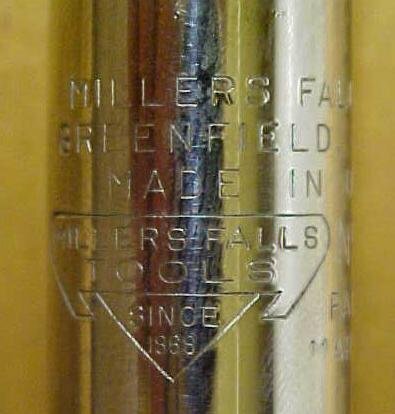 This is a very nice, clean spiral ratchet screwdriver, it is marked "MILLERS FALLS GREENFIELD MASS. MADE IN U.S.A. NO. 610A PATENTED MARCH 30, 1926" on the nickel plated area between the hand and the selector switch. It measures 18.2" long overall extended without the bit, has a rosewood stained hardwood handle. The wood handle is solid with about 95% of it's original finish intact, a few small areas of clear lacquer missing, some minor dings, looks nice. The steel screwdriver head and shaft is in very good useable condition with very little wear. Nickel plating is over 95% intact. The selector on this one moves smoothly and holds position very well, three position, left, right, lock. The spiral function is spring loaded on this one, Millers Falls calls the feature "AUTOMATIC RETURN", and can be locked in the compressed position for use as a standard or ratchet screwdriver only. 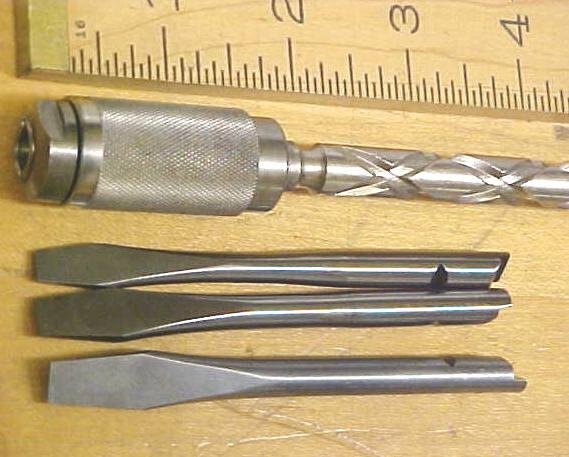 The bits are removable, and has a 9/32" or .280" diameter shank, 3 different slot bits are included, all are about 99% like new. It excepts the 9/32" size Yankee Phillips adapter bits that we also offer for sale at this website, (under Yankee with the search feature). A very nice tool, with a very strong return spring! Items Similar To "Millers Falls Yankee Ratchet Screwdriver No. 610A"